^ "Hackensack", FDU Magazine, Fall / Winter 2001. Accessed June 14, 2007. "Billed as 'A City in Motion,' Hackensack has been on the move since before the founding of the United States." ^ US Gazetteer files: 2010, 2000, and 1990. United States Census Bureau. February 12, 2011 [April 23, 2011]. ^ 3.0 3.1 3.2 3.3 3.4 Gazetteer of New Jersey Places, United States Census Bureau. Accessed June 14, 2013. ^ Welcome to the City of Hackensack 互联网档案馆的存檔，存档日期2007-10-14., City of Hackensack. Accessed July 5, 2013. ^ 2013 New Jersey Mayors Directory, New Jersey Department of Community Affairs. Accessed July 5, 2013. will be updated to show current mayor, who started July 1, 2013. ^ 2005 New Jersey Legislative District Data Book, Rutgers University Edward J. Bloustein School of Planning and Public Policy, April 2005, p. 19. ^ USGS GNIS: City of Hackensack, Geographic Names Information System. Accessed March 5, 2013. ^ DP-1 - Profile of General Population and Housing Characteristics: 2010 for Hackensack city, Bergen County, New Jersey, United States Census Bureau. Accessed December 10, 2011. ^ Municipalities Grouped by 2011-2020 Legislative Districts, New Jersey Department of State, p. 2. Accessed January 6, 2013. ^ Profile of General Demographic Characteristics: 2010 for Hackensack borough 页面存档备份，存于互联网档案馆, New Jersey Department of Labor and Workforce Development. Accessed December 13, 2011. 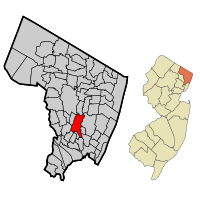 ^ PEPANNRES - Annual Estimates of the Resident Population: April 1, 2010 to July 1, 2012 - 2012 Population Estimates for New Jersey municipalities, United States Census Bureau. Accessed July 7, 2013. ^ 12.0 12.1 GCT-PH1 Population, Housing Units, Area, and Density: 2010 - State -- County Subdivision from the 2010 Census Summary File 1 for New Jersey, United States Census Bureau. Accessed September 20, 2012. ^ Look Up a ZIP Code, United States Postal Service. Accessed November 8, 2011. ^ American FactFinder. United States Census Bureau. [January 31, 2008]. ^ A Cure for the Common Codes: New Jersey, Missouri Census Data Center. Accessed August 4, 2012. ^ US Board on Geographic Names. United States Geological Survey. October 25, 2007 [January 31, 2008].